Chef-owner Jeremy Cheok of Slake restaurant has joined the management team of the Michelin Bib Gourmand awardee, New Ubin Seafood, to form Garang Grill by New Ubin Seafood, which took over the place of Slake. Garang Grill is a pop-up restaurant, ending on 31 May. “Garang,” as any NS boy would know, means “fierce” in Malay, and Cheok wishes to cook bold flavors from the $16000 charcoal grill oven by Spanish makers Mibrasa. And he has succeeded greatly. I’d strongly advise everyone NOT to eat any starters, and just whack the grilled items, but we were there for the first time and we didn’t know any better. Not that the starters aren’t good. On the contrary, they were outstanding. The honey butter wings (6pc, $12) are excellent except that they are misnamed and threw us off our expectations. It’s crispy, despite the tangy, sweet-and-spicy Thai-like sauce. The sauce is very good, piquant, seductive, exciting like a Thai mistress, but the name of the dish suggests a Korean woman (honey butter is made popular in Korea). So this mail bride order doesn’t really cash out. When it arrived, my friend whispered, “I can see why people need to order two portions.” Hahaha. Small as it is, it is dynamite. It is crispy and succulent but sliced too thinly, which means there isn’t much of a bite and, for a quick eater like me, I can’t taste much flavor. I’ve eaten better pork jowl than this in this year, so although I like it very much and although it is excellent on its own right, I think I may skip this next time. One area Garang Grill can improve on is its vegetables section. Except for a caesar salad, which only angmohs would order, there are no greens. Having no choice, and deceiving myself that I must have a “balanced” diet, we had the Asian root vegetables ($10), comprising of radish, lotus root, and sweet potato covered in hae bee hiam (fermented prawn paste). The hae bee hiam had a kick and was fragrant and delicious, but I thought they could have added some greens like petai or string bean to add color and better texture to the dish. Right now, the texture is dense and heavy, which is not the reason anyone eats their vegetables. The piece de resistance is really their grilled items. What a difference a good grilled equipment makes. If you come in a group of 4-6, I strongly recommend getting the platter ($178), which includes 600g Prime rib eye or 800g short ribs, 6 pieces of lamb cutlets, 6 pieces of pork ribs and fried rice. I also saw a table eating whole Norwegian mackerel (600g, $28), which looked delectable. Food is always better at the other table. Unfortunately, my friends did not eat New Zealand lamb cutlets (3pc, $28), which is highly recommended, and so we had the other recommended grilled item, bone-in USDA Angus beef short rib ($12/100g, ours was $84, 700g). First of all, a disclaimer: I don’t usually order steaks at restaurants. Everyone raves about the mediocre steak at New Ubin Seafood but that’s only because these people don’t cook! If you cook, you’d know how a piece of gourmet steak is easy to cook and relatively inexpensive compared to astronomical prices you pay at restaurants. It is NEVER worth paying for steaks at restaurants… unless it’s something you cannot achieve at home. And this beef short rib is something I could never achieve at home. This short rib is perfect from the head to the toe, like Megan Trainor. It’s full of smoky aroma, with beautiful, BEAUTIFUL burnt ends. You taste the sweetness of the caramelized surface and the juiciness of the tender meat that is not at all gamy. I dare say this beef is better than steaks served in most fine-dining restaurants. It also comes with a bowl of fried rice using beef fat that New Ubin seafood is known for. At New Ubin, the fried rice is a fail because it’s sticky and lumpy like glutinous rice. Excuse me, I know how fried rice is supposed to be hor. But here, Cheok adds chilli padi, which surprisingly elevates the sticky rice, and excites the tastebuds. It’s slightly too spicy for me, but pain is good. If I knew beforehand that the mao shan wang creme brulee ($9) is from The Quarters, I’d have never ordered it. This MSW creme brulee was one of the Best Desserts 2015, and I truly, deeply, madly love it, love how the strong taste of durian does not overwhelm the creme brulee. BUT when I go to a restaurant, I’d want to eat desserts that the restaurant prepares, and not catered from somewhere else. Too bad the more interesting apple and chestnut pie ($9) wasn’t available that day. My friends who had been to Slake told me that there was a legendary dish so horrible that they spat it out. And New Ubin Seafood is the type of restaurant that has good relations with the media which give favorable reviews and people acquire “The Emperor’s New Clothes” syndrome; no one dares to say the king is naked, no one dares to say it’s not good. Individually Slake and New Ubin are not great but together, Cheok and New Ubin have created something exceptional. Cheok has modified some of New Ubin’s recipes, made it his own, and made the dishes delicious and modern and extremely likeable. Futhermore, except for Fix Grill and Burnt Ends, there are few places serving grilled items this competently. The meat-centric menu has attracted many carnivores and cross-fitters and gymmers, judging from their athletic outfits. It is worth travelling to Garang Grill to eat, evident by the full house from two seatings (6.30-8.30pm, 8.30pm-10.30pm). 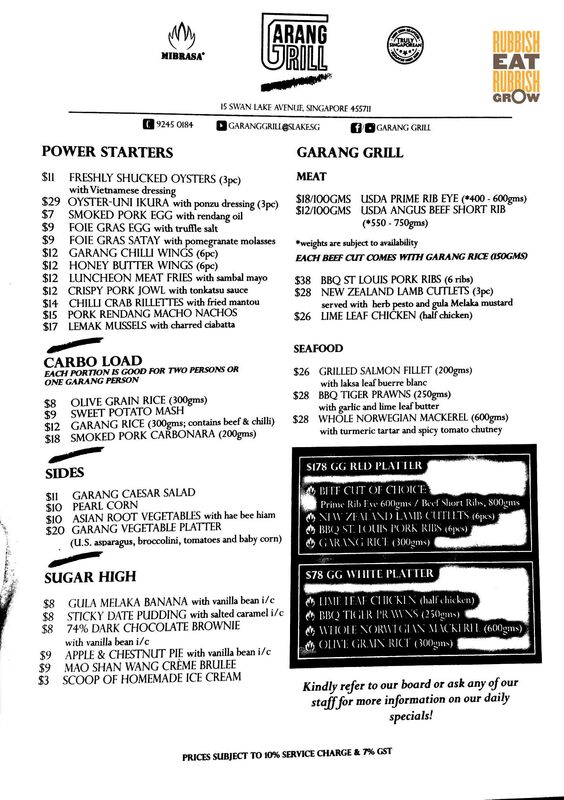 I want to go back to Garang Grill and just order the grilled items, and maybe try ALL the grilled items. We spent about $150 for three persons. This is one of my favorite restaurants this year.